Turin is the capital city of the Piedmont region (Piemonte in Italian) in the north-western part of Italy. Its elegant and a little posh style is the main characteristic of this Baroque city, which became the capital of the Kingdom of Italy after the country's unification. During the Italian industrial boom in the years '50 and '60, Turin saw a strong migration of people from the southern regions, willing to work in the big growing industries and in particular the automotive industry. Nowadays, it hosts more than one million people only in the city, while its metropolitan area is home for more than two million inhabitants. It is the fourth largest city in Italy (after Rome, Milan and Naples). It is crossed by several rivers, i.e. Po, Dora Riparia, Stura di Lanzo and Sangone, and it is surrounded by the western Alps. The history of the city starts in 27 BC as a Roman foundation named Augusta Taurinorum. According to the legend, the Roman city was born on the ruins of Taurasia, the capital of the Kingdom of Taurini which was destroyed by Hannibal on his way to Rome. It seems that in 28 BC, because of its strategic position near the Gauls, the Romans built a military camp there, called Castra Taurinorum, before dedicating it to Augustus. The city was designed according to the traditional Roman style with squared blocks. Some Roman remains are still visible in the Porta Palatina, almost in front of St. John's Cathedral. Its strategic position was very important after the fall of the Western Roman Empire, when the city was devastated several times by the passage of Barbarian hordes. After the city was conquered by the Lombards, Turin went through a peaceful period, but since the conflict between the Lombards and the Franks, Turin became one of their fields of battle. The Countship of Turin was founded in AD 940 and held by the Arduinici family until 1050. Then the city was ruled by Bishops as counts of Turin. In 1280 the city passed under the control of the Counts of Savoy, even though social fights fed its political climate. Power was manifested through the Princes of Acaia and the Savoy branches of the family. In the fourteenth century, the conflict between these two branches of the family reached its peak and in 1418 the Acaia family also lost their formal power of their domain to their cousins. With the rise of the Savoy family, Turin became a bigger and more important city in western Italy. In 1404 the Savoyards founded the city’s University. Now the Savoy family controlled both the areas of Turin and Chambery, with the former assuming more and more power over the latter, and in 1563 it became the capital city of the reign. Emmanuel Philibert, prince warrior and winner of the Battle of St. Quentin for his Spanish allies against France, transformed the city adding within two years a modern citadel. The Duke of Savoy also moved the royal residence in Palazzo Madama to the Royal Palace, which originally was the Palace of the Bishops. Charles Emmanuel I started a new urban expansion, which completely changed the image of Turin. In 1630 the “building wave” was stopped by the plague, which killed many inhabitants but resumed some years after 1700. During the Spanish Succession War, Turin was long sieged by the French for one year, until Victor Amadeus and Eugene of Savoy-Soisson set the city free. The Treaty of Utrecht in 1713 changed the duchy into reign and Sardinia was also appended to it to form the Reign of Sardinia. The reign’s capital, Turin, was transformed and embellished by the architect Filippo Juvarra, one of the greatest Italian Baroque masters. During Napoleon's rule in France, Turin was kept by two kings: first by Victor Amadeus III and afterwards by Charles Emmanuel IV. In particular, during the former’s reign, in 1799, the army of the Austrian and Russian coalition removed the French from the city, who were again restored after the Battle of Marengo in 1800. The city was deprived of all its wealth by the French who changed also its image. In 1802 Piedmont was annexed to France and Turin became one of the main cities of the French Republic. Finally, the Congress of Vienna gave back the city and the region to the Savoy family under the rule of Victor Emmanuel I. The fall of the Napoleonic dominion brought back the desire of a united Italy, which manifested itself with the creation of the Carboneria and the first liberal riots. Furthermore, the new king Charles Albert was fuelling the hopes of patriots and liberals for a united Italy under an Italian king. He started to reform his reign and in 1848 he gave the Statute, the so-called "Statuto Albertino". In particular, in the same year, he declared war to Austria. The war stopped the year after with the Savoyard defeat in Novara. Victor Emmanuel II became the new king and Camillo Benso, Count of Cavour, became the Prime Minister. The latter could weave a web of diplomatic relationships and was able to get the help of France against Austria and make Turin the meeting place for the Italian exiles and liberals, who wanted a united Italy. After the Second Independence War against Austria and the Campaign of thousand soldiers (the "Spedizione dei 1000"), in 1861 the Kingdom of Italy was created with Turin as its capital. There, the first Italian Parliament was created too, with the big protagonists of the Italian independence, such as Giuseppe Garibaldi, Giuseppe Mazzini, Alessandro Manzoni and Giuseppe Verdi, seating as members. After the annexation of Rome and the Papal State to Italy the capital was moved first to Florence and successively to Rome. Turin lost its status as capital and its economy rapidly dropped. In 1884 the Universal Exposition took place in Turin and for the occasion the city was restored and the Medieval Hamlet was created. In 1897, Turin started to become an industrial city. Many companies were born, especially in the automotive industry, the railway, education and health care systems improved; it was the first Italian city where cinema was developed. People started to be attracted by this city and Turin became more and more populated. The years before the rise of Fascism, Turin went through very hard times, with social riots that were stopped through repression. In the First World War (WWI), Turin faced a deep downturn followed by an economic boom, especially in the automotive, iron and steel industries. In 1922, Mussolini took the power in Turin, event that was followed by violent disputes between workers and fascists. During WWII, Turin turned into an important military–industrial centre and in 1943 the city was occupied by the Germans. The decline of Fascism and the occupation of the region by the Nazi led many people to move to the mountains and start the movement to oppose to them, the "Resistenza". In April 18, 1945 a big strike paralysed the city and the partisans started the liberation of Turin, ended on April 30, 1945. After the war, the situation here was quite dramatic with damaged buildings and services and a population rising every day. Since the '50s, FIAT, one of the local automotive industries, became a giant and the city was more and more influenced by its power; migrants were flowing from south Italy and from the Veneto region, in particular, and many conflicts began. In the '60s, the economic boom caused social tensions, which led to the protests of the workers and people of the years 1968–9. In the '70s the unions started to understand their power among the workers and to organise big strikes to show their dissatisfaction. In 1975, for the first time Turin was governed by a city council coming from the left party. During the "years of lead" (in Italian "anni di piombo"), a political turmoil period from 1970 to 1980, many FIAT employees, such as workers and managing staff were killed during the riots. The following years until today saw a changing of the city: the industrial system was replaced by services and research, finance and culture became the main sectors. Turin is a very interesting city and every year hosts several initiatives, such as the Book Fair ("Il Salone del Libro") or the "Salone Internazionale del Gusto", a fair of gastronomical products organised in partnership with Slow Food. Turin's centre is very particular: it is worth walking along Via Po with its porticos from Castle Square to reach Vittorio Square or from Castle Square along Via Garibaldi and its alleys. Turin is also a mysterious city. Some people claim it is one vertex of the triangle of black magic (the other cities being San Francisco and London), but others say it is one vertex of the white magic triangle (together with Lyon and Prague). It seems that Castle Square is the white centre of the city and the Fountain of Frejus in Statute Square is the black centre of the city. In particular, some say that the angel at the top of the Fountain is Lucifer and that below the Fountain a door gate to the Hell is located. In fact, a subterranean uninhabited city exists under the city of Turin, with tunnels, burrows and secret passages, which can be visited in a guided tour. However, despite the interest in Turin for the occultists, the city is also very attractive for the art and history lovers. The Mole Antonelliana: it is the symbol of Turin. This impressive tower was started in 1863 by Alessandro Antonelli and was completed only in 1889 because of a lot of debate and vicissitudes. It was first conceived to be the Jewish synagogue of the city but with the passing of time and some modifications of the project, the Jewish community stopped its construction, which was taken by the city of Turin until its completion. It is 167 meters high and it houses the National Museum of Cinema. It has also a lift bringing people up to the top of the tower. According to a students’ belief, a student cannot get to the top of the Mole before his/her graduation otherwise he/she will never graduate. Castle Square and its buildings: the square was planned in 1584 by Ascanio Vitozzi and represents the heart of the city. It has an area of 40,000 square metres and the most important streets of the city centre start from here: Via Po, Via Garibaldi, Via Roma and Via Pietro Micca. The square is located in front of the Palazzo Madama, where the first Senate of the Italian Kingdom was located, and the Royal Palace, which was the residence of the Royal Family of Savoy, after the sixteenth century. In particular, Palazzo Madama was first built by the Romans as a city gate and then, it became a fortress and finally a real royal palace until the royal family moved to the Royal Palace. Nowadays, it is home for the Museum of Ancient Art. Other important palaces in Turin overlook the square, such as the Royal Theatre, dating back to 1700, the Royal Armery and Library, containing works by Leonardo da Vinci, and a small church dedicated to St. Laurence after the victory of Emmanuel Philibert of Savoy in the Battle of Saint-Quentin in 1557. St. John's Cathedral: the cathedral of Turin is dedicated to St. John, patron saint of the city, and dates back to 1491–98. This is the only Renaissance monument of the city and was built from a project by Meo del Caprina, a Tuscan architect. In the seventeenth century the cathedral was restructured to add the Chapel of the Holy Shrewd by the architect Guarino Guarini. The Chapel hosted the relic, which is the blanket that covered the body of Christ, when he was deposed in the Holy Sepulchre. In 1997, because of a fire that notably damaged the Chapel, the relic was moved to come back again after the restoration works. Castle of Valentino and Valentino Park: The castle dates back to 1200 and was bought by Emmanuel Philibert of Savoy on the advice of the great Andrea Palladio in 1564. The actual structure is due to Princess Christine Marie of France, wife of Victor Amadeus I, who wanted to have a castle similar to the castles (château) on the River Loire. According to the legend, the duchess would bring her lovers there and later throw them into a well. The building has a horseshoe shape with four towers and a cohort with marble floor and, nowadays, it hosts the Faculty of Architecture of the Polytechnic University of Turin. The surrounding park is very appreciated by the locals. The Universal Exposition took place here in 1884 and several floral exhibitions take place here too. In the park the Rococo-style Fountain of the Twelve Months is located. Within the park the Medieval Hamlet is situated. It was built as a pavilion for the Universal Exhibition of 1884 and was meant to be destroyed after the exhibition. However, this site, made of fifteenth-century buildings, streets, fountains, squares within walls and dominated by a stronghold, became an open-air museum. The Egyptian Museum: This museum is considered as the second important Egyptian museum after the one in Cairo and has been located here in Turin for more than two centuries. It is hosted in the Palace of the Science Academy, which dates back to the seventeenth century. The museum was founded in 1826 by Charles Felix, who bought the private collection of the French consul in Egypt, Bernardino Drovetti. The collection was expanded with the findings of the famous Italian archaeologist, Ernesto Schiapparelli. One can see here the Papyrus of Turin, which explains the sequence of the kings of Egypt; the Papyrus of the Golden Mines, depicting the map of a mining centre in Nubia; the tomb of Kha and Merit, i.e. the architect that supervised the construction of the tomb of Amenhotep III; the statues of Isis and Sekhmet found in Karnak. The latest acquisition of the museum is the temple of Ellesija, given to Italy from Egypt, for thanking Italy to have helped during the works for the construction of the dam of Assuan. Carignano Palace: it is one of the best examples of Baroque architecture in Turin. The palace was built in the last part of seventeenth century from the plan of the architect Guarino Guarini for Emmanuel Philibert of Savoy. The anterior facade faces the Carignano Square, while the posterior facade, built in eclectic style between 1864 and 1871, faces the wide Charles Albert Square and the Old Royal Stables, which nowadays host the National Library. 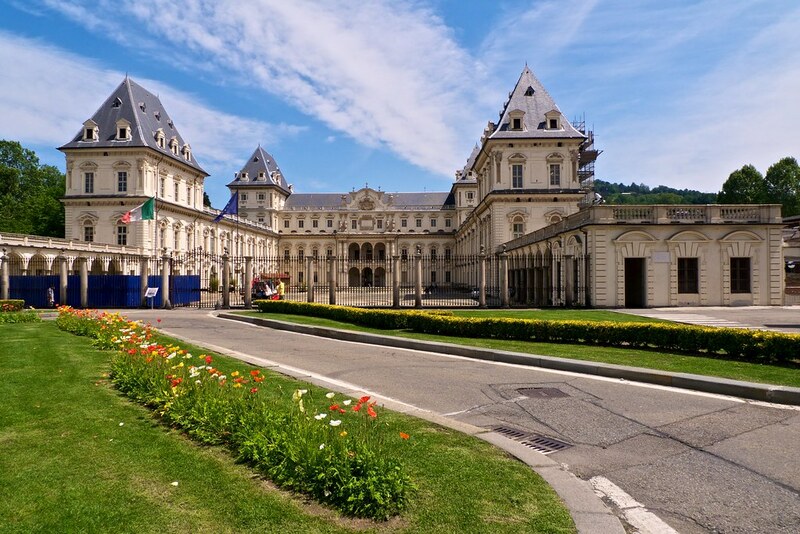 The Palace played an important role in the Italian Risorgimento and after the Italian unification in 1861, it became the seat for the Chamber of the Deputies of the Italian Kingdom’s Parliament. The visit in Turin does not end with the tour of the city. The surrounding area boasts other beautiful attractions. Particularly important are the Residences of the Royal Family of Savoy, which are included in the UNESCO heritage list, such as the Palace of Venaria, the Hunting Residence of Stupinigi, the Castles of Racconigi, Aglié, Rivoli and Moncalieri, and the Villa of the Queen. The Sacra di San Michele (St. Michael's Abbey) is a medieval monastic complex situated in the south side of Val di Susa. Remains of very impressive fortresses still exist in the area, such as the Fort of Fenestrelle or the Fort of Exilles. The city centre is still the best place for shopping in Turin. Along the streets Via Roma, Via Garibaldi and Via Po, one can find many national and international fashion brands, as well as local shops. In San Carlo Square there is the San Carlo Men Store, a store of thousand square metres, completely dedicated to men’s fashion. The area is very popular so, it is better to avoid shopping on Saturday, when these streets become full of tourists, shoppers and other passengers. Just outside the city, one can also find departments stores, such as Auchan (at the exit of the highway to Milan) and the Shopville Le Gru (at the border with Grugliasco). For the market lovers, the Porta Palazzo Market is definitely worth the visit. This seems to be the biggest open-air market in Europe with stands expanding also in the sideways of the square. Other markets are the market of Corso Racconigi and the elegant Market of Crocetta. However, there are many other markets that are quite popular and open every day in several spots of the city. Turin is a very lively city. After an entire day spent in, visiting monuments, one can go out and enjoy the city’s entertaining atmosphere. Before dinner, at around 18:00 or 19:00, people go out for the “aperitif”, populating the many bars, cafés and wineries, to chat and taste some good food and drinks. The city abounds in discos and clubs for dancing until late, such as in the Murazzi area or inside of the Valentino park. In the Vittorio Veneto Square area, one can find many bars, where people gather to chat and relax with a drink. The historic borough of the Quadrilatero Romano is also a neuralgic centre for going out, with its traditional and ethnical bars and restaurants, which, especially in summer, are populated by people eating and drinking outside. In summer, a visit to the River Po-side of the Valentino Park is worth, where the so-called "Imbarchini" are located. These are bars facing the river that are quite popular for a drink before going to dance in the clubs. In Turin one can find many typical dishes. Starting with pasta, "agnolotti" is very typical type of square pasta filled with meat. This kind of pasta was originally made to use up the leftovers of the Sunday lunch, which was used to be very rich in food. The best sauce to go with them is the "brasato", a meat-based sauce where meat is braised in Barolo wine. Another typical dish is the "bagna cauda", a sauce made mostly with garlic and anchovies to eat with raw or cooked vegetables. Turin is also well known for its chocolate; in fact the "gianduia" taste was born here. Turin and its surrounding region of Piedmont are particularly famous for their wines: among the white wines it is worth mentioning Gavi, Arneis, Erbaluce, Moscato and among the red wines we have Dolcetto, Barolo, Barbera, Nebbiolo, Brachetto, Barbaresco and Bonarda. The blue pins with the letter H indicate the location of various hotels in Turin. Click on the blue pin for more information about a specific hotel.